I enjoyed this historical read about the hardships that the settlers encountered in 1850s Australia. Starting their journey in Sydney, Philippa, or Pippa, Noble and family have recently arrived from England. Her father, Gerald, has gambled most of their money away and taken a loan out from a cousin. He uses the money to buy land in the outback and create a stud-farm, several days journey from Sydney. Pippa is a perfect, feisty heroine who, her father says, should have been a boy. She insists on accompanying her father into rather dangerous country to view the land he's been granted. It isn't a comfortable journey but, when she sees their land, she falls in love with it. Her father is ill and returns to Sydney, leaving his daughter to start the development. 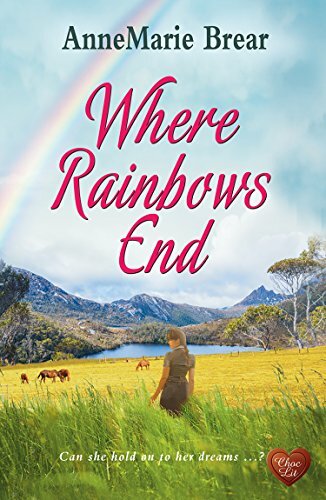 There is much to enjoy about "Where Rainbows End", the fabulous and surprising settings, the hardships the characters face and how they overcome them. I was pulled in by the romance too. Pippa might be a "take-no-prisoners" heroine but she's got a soft, feminine side about her. I very much enjoyed the heartbreaks, the friendships and the would-be lovers that she encounters and I was rooting for her every time. This is my first AnneMarie Brear book and it won't be my last. I enjoy her simple, yet suspenseful, way of writing that created a compelling story. I found it difficult to put down. Can't say better than that, can you?